When Richard “Chico” Perales says that the Lake El’gygytgyn International Drilling project based above the Arctic Circle in Far East Russia was one tough gig, you know it was hard. Polar Field Service’s Texas-based Field Logistics Coordinator has endured enough hair-raising, mentally and physically grueling experiences, and otherwise challenging situations to warrant his own reality television show. He’s sweated through stints on projects helping build petrochemical and chemical refineries, oil rigs, power plants, shipyards, and has spent most of the last two decades working at both poles. Most recently, he was involved in the successful core drilling project in the remote wilderness east of Siberia. 2009 Lake El’gygytgyn, Chukotka, Eastern Russia. Monitoring one of the “flood” pumps used for thickening the lake ice sheet. 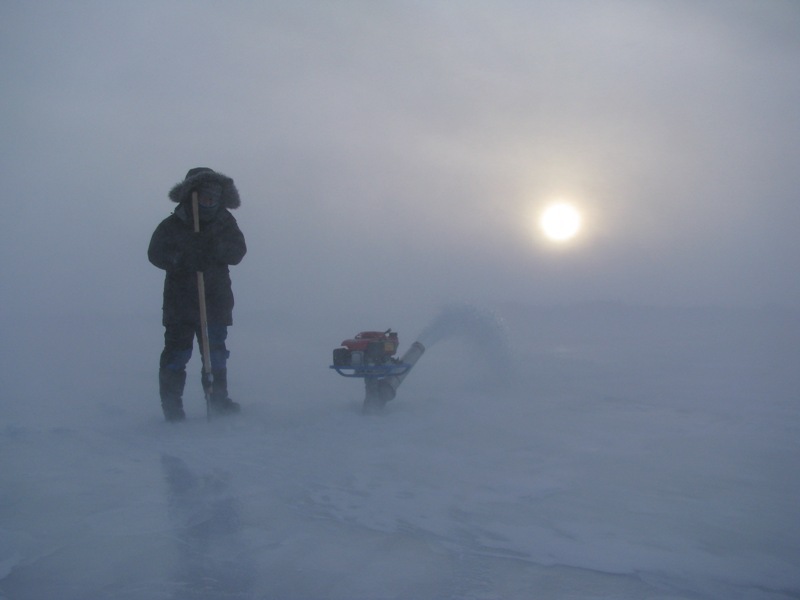 The ice covering on the lake had to be thicker than the natural process had made it so that it could sustain the weight of the drilling platform and associated equipment. “It was the most grueling project I’ve worked on,” says Chico, who came out of Chukotka, Russia, with the last of the scientists, drillers, and media personnel on May 19. To say the least, Russian logistics presented obstacles: Flights were cancelled. Luggage was lost or didn’t arrive with its owners. Custom issues surfaced unexpectedly. Communication suffered from language and local culture barriers. Equipment broke down in the bitter cold. Extreme weather hampered helicopter support flights. In the field, during the darker and colder months of winter, Chico feared his eyeballs would freeze due to the relentless high winds. His goggles would fog, and with the temperature clocking in at 40 to 50 degrees below zero, his eyes watered. He had to keep blinking to keep the water from setting as he tried to quickly get to a cloth he carried to dry them. Glasses made it harder to keep various areas of his face from getting frost nipped. He wasn’t the only one battling the elements. Some team members had snow boots that didn’t keep their feet warm. For others it was their hands. The dilemma was the same: How to stay warm and comfortable enough in the extreme cold to be able to function properly. The Lake El’gygytgyn field camp on the perimeter of the crater lake. It’s been a long journey for the El Paso, Texas, native who saw little snow until he turned 19. After graduating from high school, Chico found himself wondering what to do with the rest of his life. He and a friend headed to Oklahoma in December with twenty dollars his mother had given him (that’s all she had) to find work. They ended up in North Dakota. After two weeks of finding no work in the farming community and in desperation, he convinced a reluctant Halliburton project manager at a construction site on a gas field to hire him, offering two weeks of free labor to prove his worth. When the trial period was up, Chico got the job and a raise to go with it. When that job finished, he transferred to Texas and then worked all over the country picking and choosing his jobs. As for adjusting to the extreme climate, he claims growing up in Texas heat toughened him. 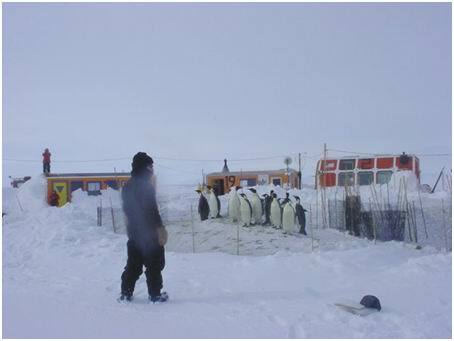 In the early part of this decade, Chico worked at both poles; he joined Polar Field Services in 2005 to work on a hydrology project in Barrow, Alaska. At the time his mother was gravely ill, and the move returned him to the Northern Hemisphere fulltime. He could rush home if needed. 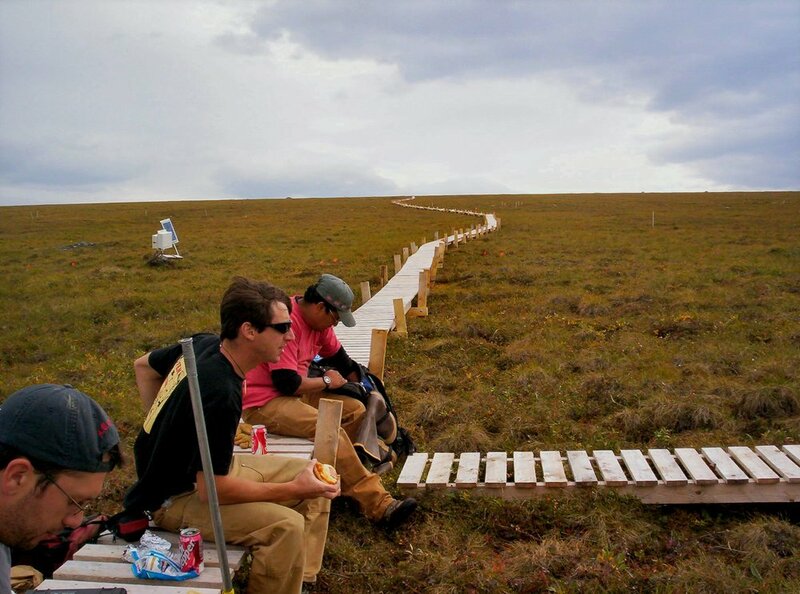 Installing an elevated boardwalk near Inuviat Creek in Eastern Alaska so scientists could conduct their research on the tundra without stepping on it. Professionally it was a good fit, too. “Polar Field Services has been good to me. I’ve always been kind of a nonconformist and so a 9 to 5 desk job just doesn’t work for me,” says Chico. “The whole office thing was not my cup of tea so instead I chose to go into the field. Chico helps a team as it carries the oldest Elder of the King Islanders the top of the island so he could be helicopter-evacuated after his health deteriorated. A storm delayed the rescue for two days. King Island, 2004. Chico points out that someone who drives you crazy can teach you patience and tolerance. Going to remote places in the world where people have little—through no fault of their own—puts things into perspective as well. Good things happen to people who are in the light, says Chico. Closed doors open in places where you know no one. Help appears when you don’t expect it. In need of an English-speaking translator while in Russia, he met a woman on the plane to Pevek who had worked in the states and so spoke and wrote fluent English. He hired her. Later he discovered her dad was one of the Russian drillers, and her familiarity with the work facilitated her translating. “Luck?” asks Chico. “To some people, yes, but not me. I had no doubt that I would find someone who spoke English or they would find me. I don’t believe in luck so I strive to be in the light. At times it’s a flicker that wants to go out so I have to keep adding kindling to keep it going. At the end of the day it’s not so much what you did that defines you but how you did it."